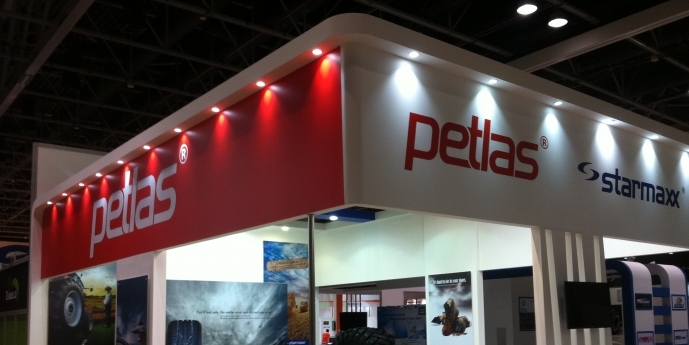 Petlas Tire Corporation participated in Automechanika Middle East, taking place from June 11th to 13th at the Dubai International Convention and Exhibition Centre. Automechanika Middle East, which is the largest professional auto accessories and tyres exhibition in the Middle East, numerous exhibitors and buyers from all over the world in attendance. During this exhibition, PETLAS and STARMAXX brand PCR-LVR-4X4-AG and OTR tyres exhibited. PETLAS PT 741 and STARMAXX ST 760 an ultra high performance (UHP) new designed tyres also exhibited. PT 741 and ST 760 tyres are; premium tyres that fulfilled performance in multiple environments by maximising control stability and minimising rotation resistance. Many visitors showed too much interest to Petlas & Starmaxx booth , meetings were held with more than 200 new companies in order to start a cooperation with PETLAS & STARMAXX tires. Also, evaluation talks for 2013 sales and 2014 targets were talked over with the existing 29 distributors from the North Africa- Middle East and Mid-South Africa region. Automechanica Dubai is the world’s fastest gowing trade show in the Middle East. Automechanika spotlights innovations and solutions in the fields of parts, systems, tuning, workshop equipment, bodywork & paintwork, car wash, IT & management and the latest automobile services.The show draws in more than 17310 business visitors from 130 countries.